Chemical peels produce an even, shedding of several layers of damaged skin cells. This leaves you with a new fresh layer of skin, with more uniform texture and color. We review your medical history and examine your skin type and pigmentation to determine which, peel is right for you. 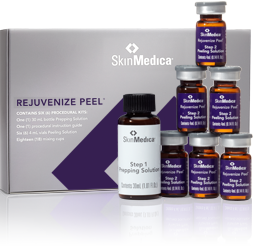 Suitable for any skin type or color, this peel is quickly becoming one of the most talked about skin rejuvenation treatments. 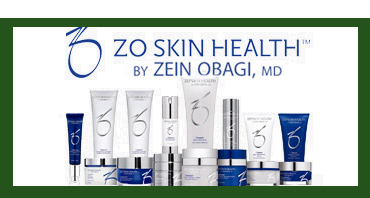 It was created by Dr. Zein Obagi, the dermatologist responsible for the Obagi line of skin care products and the founder of ZO® Skin Health. 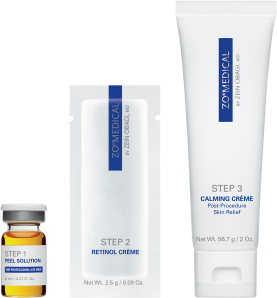 Step 2 is the application of the Stimulating Retinol Creme that works to stimulate cellular function at a deep level for collagen enhancement, firming, and wrinkle reduction. The Stimulating Retinol Creme (Vitamin A) is key to the great results. Jessner's peeling is considered a 7-10 day chemical treatment designed to remove superficial layers of skin. The solution is applied to your skin with gauze, cotton applicators, or a small brush. Because the solution is a combination of mild acids, some stinging usually occurs during the application , therefore, a small fan will be provided for comfort. The treatment takes approximately 1 hour to perform. Afterwards, your face will typically be white and frosted. This will last from 2-3 hours, and will then subside. The first couple of days, your skin will feel tight, dry, and have a sunburned appearance. Peeling will usually begin by day 3 and last for 4 or 5 days. It is used to help dry out active acne, to reduce shallow wrinkling and scarring, and to lighten hyperpigmented, dark patches on the skin. The treatment may be performed as often as 6-8 weeks, if desired. Rejuvenize Peel is an advanced formulation of peeling agents, with a built-in anti-irritant and penetration enhancer that provides controlled exfoliation of the uppermost damaged layers of the skin to reveal fresher and healthier skin. Provides predictable results with minimal down time. Effective for use on skin with sun damage, melasma, pigmentary changes and acne scarring. Noticeable improvement with just one peel. Recommended for Skin types I-VI. Can be used on skin types V-VI after the patient has established tolerability to Vitalize Peel, or with physician consent. Well tolerated with minimal "down time" Easy to use (does not require timing or neutralization). A novel synthetic surfactant, Isoceteth-20, creates more uniform peeling while controlling penetration of salicylic acid, and therefore reduces skin irritation associated with the stronger chemical peels without diminishing peeling effect. The Vitalize peel is considered a 3-5 day peel designed to remove superficial layers of skin. The solutions are applied to the skin with gauze in a 3 step process. Some stinging may occur during the application ,therefore, a small fan will be provided for comfort. 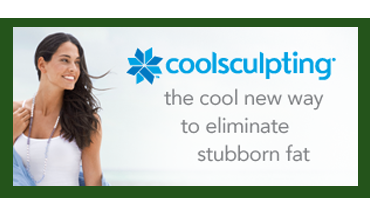 The treatment takes approximately 20 minutes to perform with little to no downtime. Once leaving the office the patient is discouraged from washing their face for 6 hours in order to get the full effect of the peel. The Vitalize peel is gentle enough to use every 3 weeks for maximum benefits. Chemical peels primarily containing alpha hydroxy acids may be referred to as “AHA chemical peels” or “ glycolic acid peels.” Glycolic acid is the most common type of alpha hydroxy acid used in skin care. Glycolic acid us a natural acid extracted from sugar cane. During a glycolic acid peel session, the chemical is applied to the skin between 3-5 minutes , then neutralized with water. Moisturizer and sunscreen will be applied to the skin prior to leaving the office. The treatment takes approximately 15-20 minutes to perform. We recommend 6 glycolic acid peels performed at two-week intervals, after the start of glycolic acid products at home treatment. Occasional glycolic peels can be performed, as one would a facial, to maintain beautiful skin. Glycolic peels can be performed on the face, neck back, hands, and arms. During the procedure, the skin is first cleansed of oils. A solution is then carefully applied and is allowed to remain on the skin for a short period of time, in some cases for longer periods of time, in order to remove the layers of damaged skin. During the procedure, most patients experience a warm to somewhat hot sensation that lasts about 5-10 minutes, followed by a stinging sensation. Before leaving the office, most patients no longer feel any discomfort. Since we offer different kinds of peels, the procedure may differ a little with each. The procedure can be performed on the face, neck, chest, hands, arms and legs. What should I do after a chemical peel? To schedule chemical peel consultation with Brandon Dermatology click here.